There are some spoilers as to the identity of one of the Black Lanterns, so be careful about reading the text. Too bad we didn't get this character though. 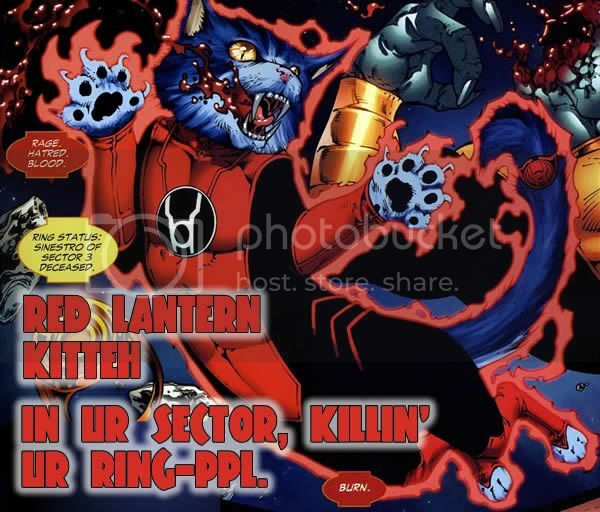 Credit for the lolcat goes to Rich Lane at the Captain Comics message boards. 1 Alpha, 1 Red, 1 Blue, 1 'other'. I too am surprised they spoiled part of the story with this. I was expecting Arkillo (Yellow) and Agent Orange instead of the Alpha and the 'other'. Yes, trying to be cryptic as to not give away too much. Read the link if you want to know the rest. I might actually pick up Atrocitus & Walker. They'd be the first DCD figures I'd buy in well over a year, if so. They look pretty neat. These will be the first DCD figures I buy in two years. The fact that they're aliens will help reconcile the difference between them and the DCUCs. i'm in for the Alpha Lantern. The others... i'll wait to read more GL stories and get into Blackest Night to make my descision. They look good though. If you've been reading the GL series, these all make sense and 3 of the 4 have already been featured. 3 out of 4 are buys for me. Probably. I'll have to wait to see what the Last looks like to decide for sure, but It's most likely i'll grab it. The Alpha Lantern though is a definite skip for me. I just don't like the design and i don't like the characters in the book. Besides, with the Mask in it looks to much like an Evil Version of a Blow up Doll. DC Direct's website has leaked the next wave of figures in their Saint Walker announcement. There's a new John Stewart plus another hidden figure who I'm guessing is [spoiler]the Martian Manhunter[/spoiler]. And it sure does look like the character you mentioned in the box to me too! That's a great John Stewart figure. I'm in. this line is looking better and better. These two waves are awesome. But I also hope we get Arkillo soon! He's badass! And that sniper yellow lantern! Wow, the Indigo Lantern and Sinestro Corps member are both awesome. Again, more aliens means more characters on my DCUC shelf. Badass. whoa, MAJOR SPOILERS here...thanks to bjread on Fwoosh. Bedovian, I think his name was? I'm really liking the look of these guys...very curious to see what the Orange Lanterns look like. The Black Lanterns are both cool and seriously messed up at the same time!